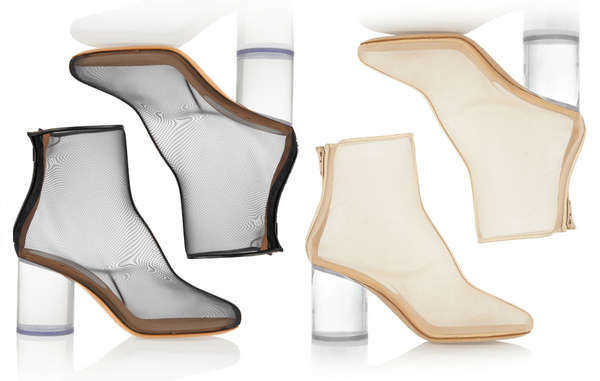 Maison Martin Margiela's 'Perspex Boots' are entirely see-through. 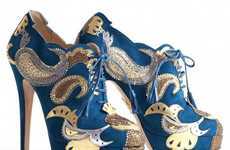 The Belgian label has enjoyed an extended period of dominance over the couture footwear industry, and it is easy to understand how and why this has occurred with a look at these pieces. The clear 75mm/3inch heels provide a sturdy base for the Perspex Boots. 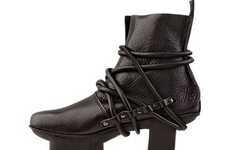 Black and beige leather trimming lines the top of the shoe, adding to their extravagant if not zany style. Net-a-porter recommends the pairing of these chunky Maison Martin Margiela pumps with skirts and mini dresses in a deliberate attempt to show off the transparent designs. 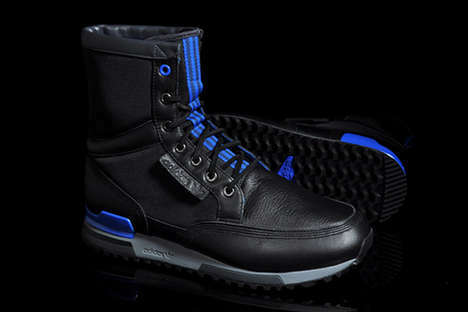 On top of being exceptionally eye-catching, the Perspex Boots are also durable and airy at the same time. 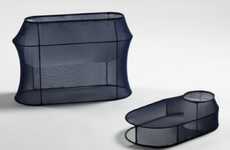 The sheer mesh fabric protects the foot from the outdoors while giving it space to breathe, merging fashion with practicality.